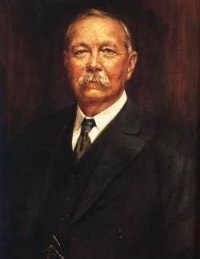 Welcome to Sir Arthur Conan Doyle – His Life, All His Works and More, a leading website bringing you the works of Sir Arthur Conan Doyle including his most popular creation Sherlock Holmes. Sherlock Holmes is the master detective created by Sir Arthur Conan Doyle. This site brings to you the four novels and several of the cases of Sherlock Holmes, written by Sir Arthur Conan Doyle. You will also find the other novels of Sir Arthur Conan Doyle, including The Lost World. We are continuously updating and adding more stories and novels so do check back often. Alternatively, subscribe to our feed to get the updates in your favourite feed reader or via email. In 2003, when the site saw a transition with the focus widening from Sherlock Holmes to his creator, Sir Arthur Conan Doyle. sirconandoyle.com was officially registered on 12 June 2005 to make his forever green stories easier for you to access. Today the site is a leading source of information on the author with visitors from all over the world. The source of most of the books you can read is The Project Gutenberg. Many of the graphics you see in the story are courtesy Pinacotheca Holmesiana. It has the largest collection of graphics from The Canon.